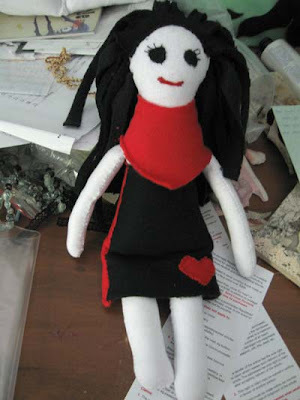 The idea, for those of you who haven’t seen it yet, is to make a doll and then leave it somewhere for someone to find with a tag that says TAKE ME HOME, I’M YOURS and some contact info for the Toy Society. In other news, my top hat sold on etsy. How ace is that? It’s been a long time since she’s been used, and now she’ll be winging her way to America where the lovely Stephanie will love her and keep her and feed her well. Stephanie has the same problem I have, which is a 23 inch head. This makes for not a lot of hats that fit. She’s been looking for a top hat for a while but they’ve all been too small. Until now! Yay for the interconnectedness of etsy, the web and the community. 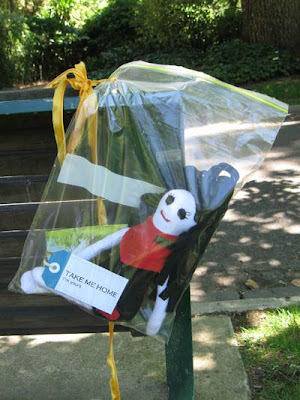 This toy drop is such a wonderful idea…maybe i can get on board next year….and your top hat…oh one of the best things on etsy australia…pleased for you that it’s gone…and for me cause i can’t covet it anymore! Hey Chrisy! Thanks a lot! Yeah, the toy drop is an ace idea, but the Toy Society does it all year around, the Christmas drop was just a massive one. If you email them, you can do it any time you like. And gosh 🙂 thanks so much for coveting the top hat! That always warms my heart. It’s lovely to hear good feedback on items one has made.